Preheat your oven to 350 degrees. Butter a 9x13 baking dish, then line with parchment paper and generously butter the paper. In a small bowl, combine flour, baking soda, and salt. Whisk together and set aside. In a large bowl, cream butter and sugars. Using an electric mixer, beat on medium speed for approximately four minutes. Add in the eggs and vanilla. Lower the speed, and gradually mix in the flour, until just combined. Stir in chocolate chips. Spread the cookie dough in the bottom of the prepared dish. Top the cookie dough with a layer of Oreos. Next, prepare brownie mixes according to package directions. Mix in hot fudge sauce. 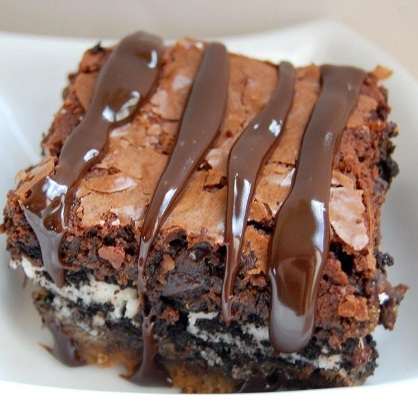 Pour brownie batter over the cookie dough and Oreos, and spread evenly. Bake for 45 minutes. Let brownies cool completely before cutting. Serve with additional hot fudge topping if desired.